For those who will be journeying out late Thursday, May 3rd, just to see The Avengers on the big screen at midnight into May 4th, you'll already have a treat by seeing Earth's mightiest heroes assemble on the big screen for the first time ever. But if you're seeing it on an IMAX screen, not only will you see it in the largest format possible, but for those attending the midnight screening, you'll get a limited edition poster to commemorate this iconic moment in your cinematic history. 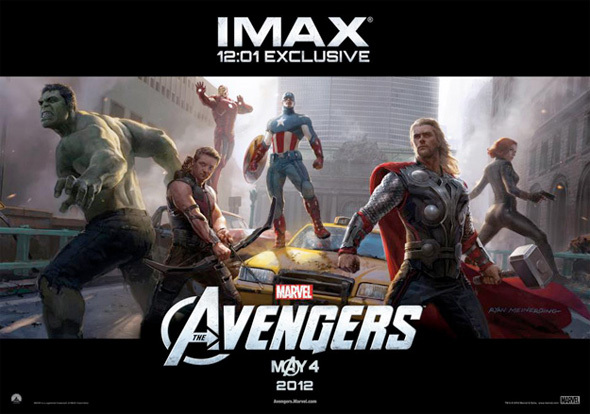 IMAX has just revealed their exclusive swag that will be in your hands as you sit back and enjoy the glory of The Avengers around the country. Look! Looks better then the rest. Really? Damn! Ok no one go to see it, now that we have this information no one needs to waste their money, thanks Asdas! Will I ever find true love Asdas? The poster isn't that great compared to the one for Ghost Protocol (which I still need to get framed!). However, I support the hell out of the studios for going down this route. First, it gives people incentive (no matter how small you might think that is) to get out of their home and go to the theater. Second, it gives them a keepsake for a film that they more than likely truly enjoyed (especially if they keep it). The biggest flaw is that it puts even MORE emphasis on the opening weekend, and in this case, opening night. For the sake of theaters, that is bad. But it is fantastic for the studios as they can get out of a theater with the lion share of their profits. Nice photomontage. Remember when artists actually did art? Considering this being made by a comic book company some of these posters are laughable. Give use Nerf hammers and I'm in! This is actually the best poster. The rest of the marketing has been awful. Loved the movie, too bad no poster for me.